Open Table is a group of trained members who make a year commitment to start a community and relationship with one Brother or Sister. Over the course of a year, the Table works together to set goals, foster accountability, and implement a plan to create change. The common goal of all at the Table is transformation for the Brother or Sister – from poverty to independence. 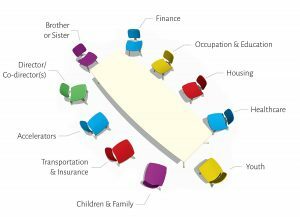 Open Table’s faith-based model draws together the community and relationship life of congregations around the country. It provides technical support, training, and structure. Each Table is composed of a group of volunteers that make a year-long commitment to act as a team of life specialists, encouragers, and advocates.